Initially constructed under Caesar’s and further altered under Augustus’ reign, the speaker’s platform towered above the west side of the open Forum area, where it is still visible today upon entering the excavation site. This platform used to be the central stage for the political self-representation of the Roman Emperors: It was here that the Emperors addressed and presented themselves to the people, who would gather in the area in front of the platform; here the Emperors welcomed foreign rulers and were attended in public; here the bodies of the dead Emperors were presented to the people and funeral speeches were held. 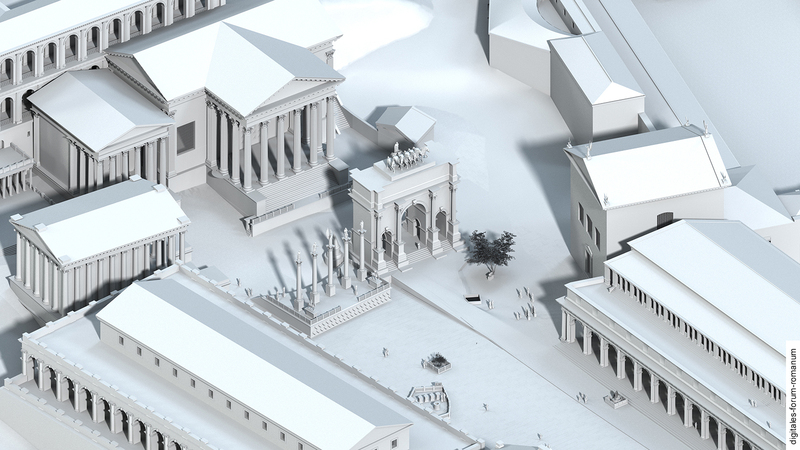 At first sight, the Rostra Augusti (lat. 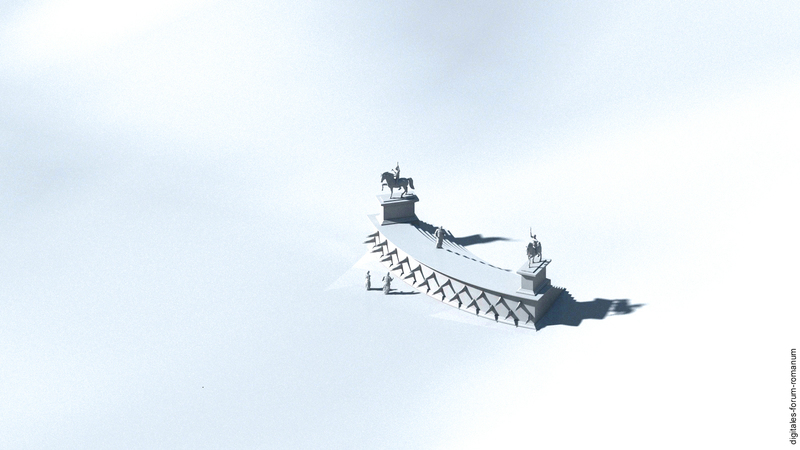 rostra: neuter plural) seems to be a typical structure designed for Imperial self-representation. However, this platform has a much more complex history as a structure of high symbolic significance that united the Republican past with the Imperial present. The complex meaning of the Rostra Augusti is due to the fact that it was erected at a time when Rome was placed under Imperial rule, while it was simultaneously meant to preserve the idea of the old Republican speaker’s platform. It ultimately became its successor. 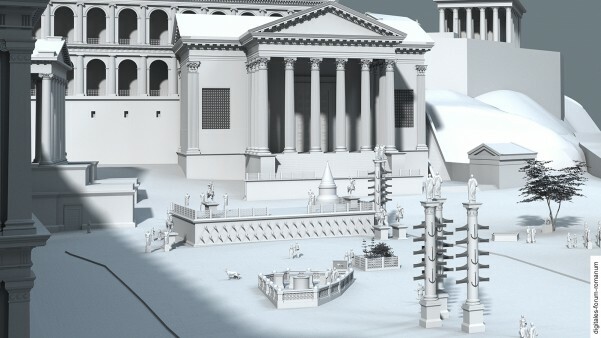 The Rostra Augusti took on many aspects of the former speaker’s platform with regard to its function and its display of naval rams (rostra): In 338 B.C. 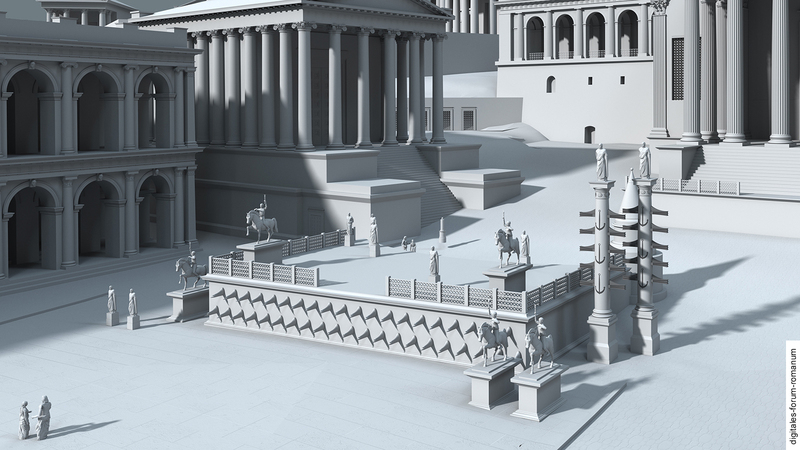 naval rams from the captured fleet of the rebellious city of Antium were attached to the speaker’s platform for the first time, symbolising the Roman victory, and this is where the name for the platform (that was later introduced) – “Rostra” – derives from; the platform from the Imperial Age inherited the name from its Republican predecessor as well as the practice of displaying the naval rams. The old Republican Rostra were situated north of the Rostra Augusti, in the north-west corner of the Forum area at the Comitium and the Curia – the most important gathering places of the Roman people and Senate. In the Late Republic this speaker’s platform was relocated to the west end of the actual Forum square. 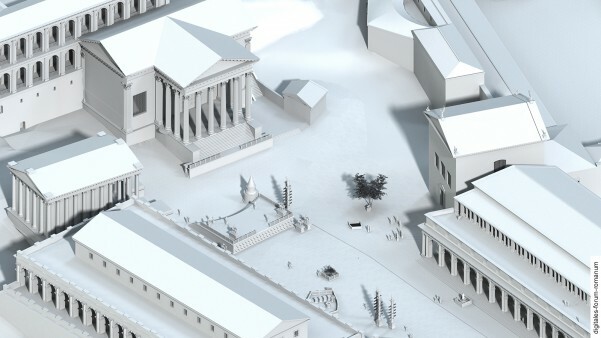 It was at Caesar’s request that the platform was relocated, although it was his close companion Marc Antony who was presented as the financial benefactor of the new Rostra. 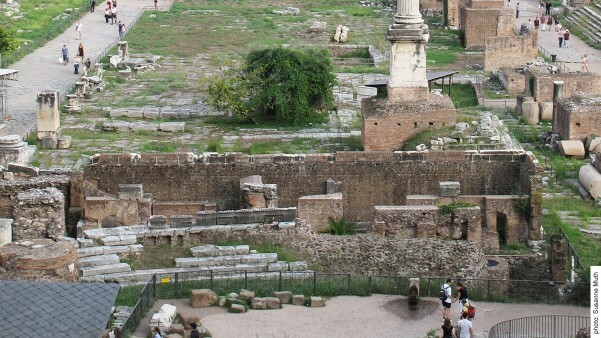 The fact that Marc Antony later became Augustus’ enemy might have been the reason why these “Rostra Caesaris” were fundamentally reshaped by Caesar’s heirs some decades later and why they were renamed “Rostra Augusti”. 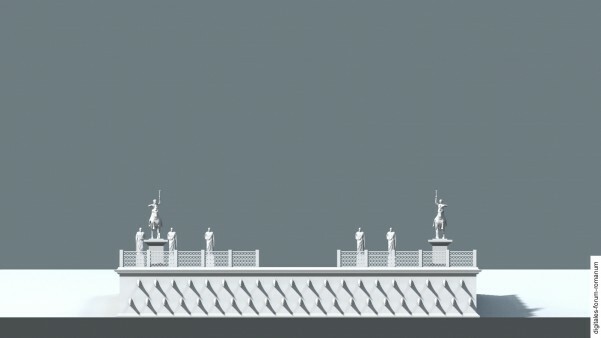 In the course of the Imperial Period the substructures of the speaker’s platform were reinforced in order to hold the increasing number of monuments that stood on the platform. 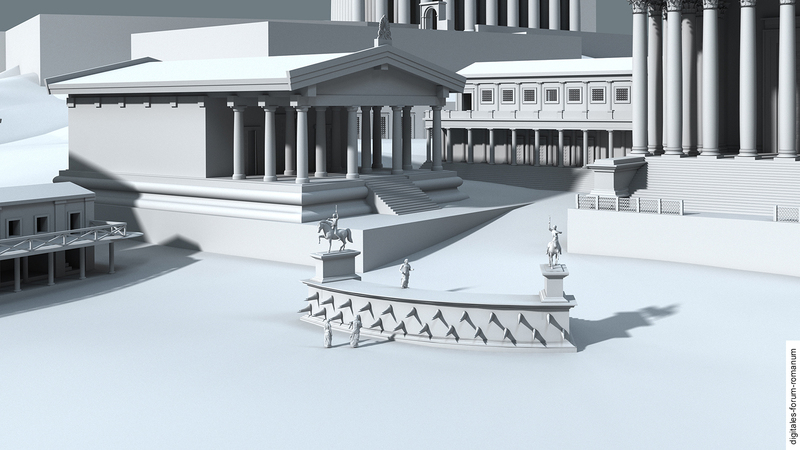 During the Severan Dynasty (beginning of the 3rd century A.D.) the speaker’s platform underwent another radical change. 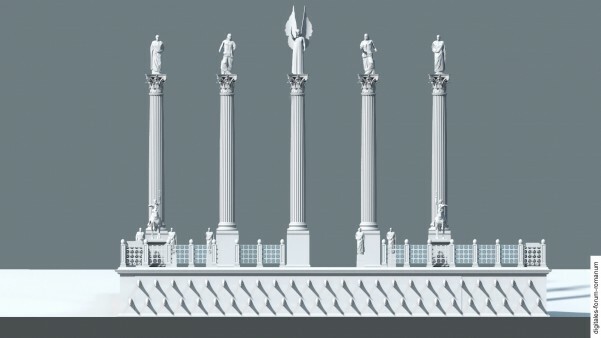 It is possible that a monument with five columns was erected on the Rostra at that time and we have solid archaeological evidence of that starting from the Tetrarchy (late 3rd century A.D.) The last structural alteration that was made to the Rostra also possibly occurred during the Terarchy or in the late 5th century A.D. This led to the platform being extended northwards (“Rostra Vandalica”). (For the individual phases, see below). 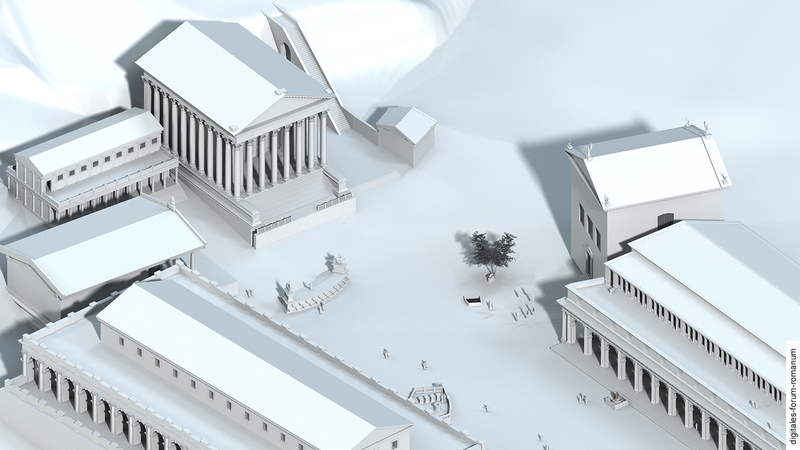 Nowadays it is possible to come up with a pretty good reconstruction of the appearance of the Rostra Augusti based on the surviving remains on the excavation site. However, some of the elements that are still visible today originated from restoration procedures and modifications that were carried out after the excavation of the Rostra at the beginning of the 20th century. It is easy to recognise the round set of steps on the west side, which dates back to the Rostra that was erected by Caesar: What has survived is the core composed of opus caementicium, whose marble facing can still be seen on the north-east side. In general, we may say that what we see at the present day is the Caesarian platform in its revised form from Late Antiquity. The steps on the west side once led up to a rectangular platform, which was entirely covered with wooden planks and reached as far as the walls that were made of tuff ashlar blocks and formed the eastern end of the platform. 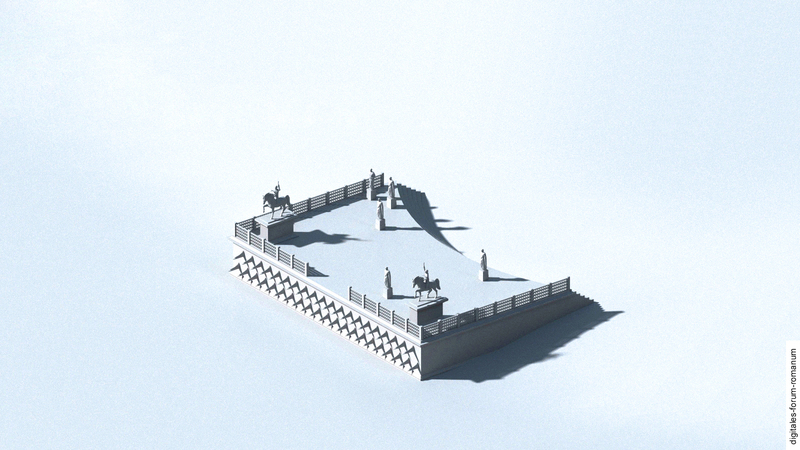 This platform, together with its ashlar walls, belonged to the structure that Augustus had placed in front of the curved Caesarian platform. 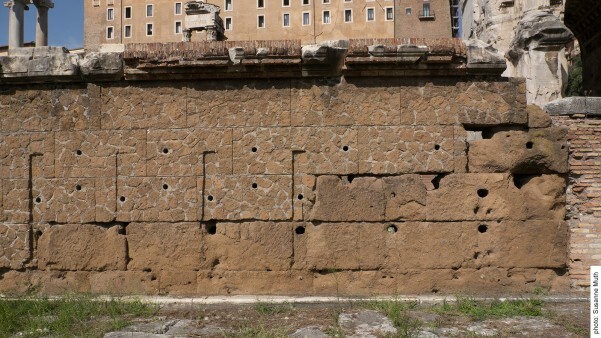 If one examines the remains of the tuff wall of the Rostra Augusti, then it is still possible to make out where the marble facing as well as the naval rams of Antium had been affixed. In the area between the walls that were composed of ashlar tuff blocks and the caementicium core of the round tiered Caesarian platform, which was once entirely covered with wooden planks and formed the area of the platform where the orators and honorific monuments stood, different kinds of structural elements were installed. These procedures give us an idea of the various types of alterations that were made to the substructure over several centuries with the purpose of stabilising it. (see below for images of the present-day ruin). 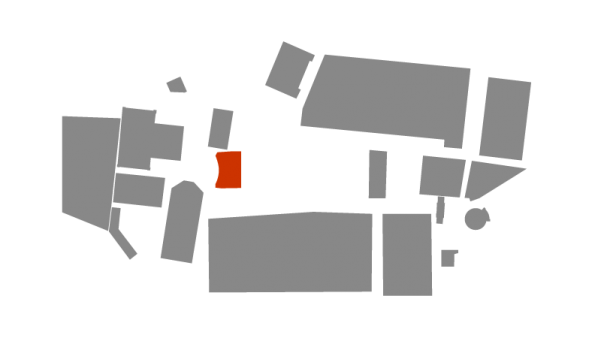 Analogous to the old Republican Rostra on the Comitium, the Rostra Augusti from the Imperial Period had a distinctly multifunctional and ideologically significant character. However, it was primarily used by the Emperor and his family. The Rostra had once been a place from which different politicians had addressed the people, proposed laws and presented resolutions; now, it was focused upon the Emperor and his self-presentation before the people. Where once outstanding figures of the Roman elite had been publicly displayed after their death and honoured by funeral speeches (lat. 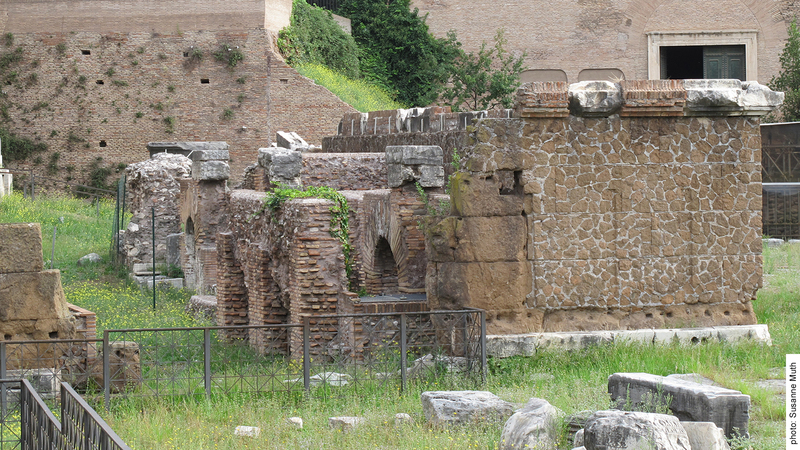 laudatio funebris), there now stood a structure where such actions were reserved for the Emperor and his family. Where once numerous honorific statues and victory monuments had been erected, and politicians and generals had been celebrated as praiseworthy role models in front of the entire citizenry, there now stood a structure which focused upon the Emperor’s glory. In short: Whereas the old Republican Rostra at the Comitium had served as the central stage for all forms of political communication and self-representation during the Republic, the Rostra Augusti now took up this role in Imperial Rome. 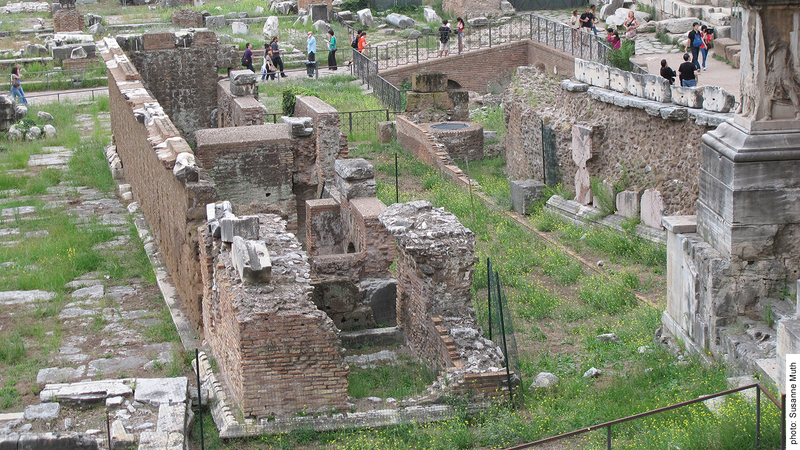 Caesar initiated the relocation of the Rostra: He abandoned the previous location of the Rostra on the Comitium in 44 B.C. (back then, the entire area of the Comitium was reshaped and reinterpreted with regard to function) and had a new speaker’s platform erected on the west side of the actual Forum area. This is where the Rostra would remain. 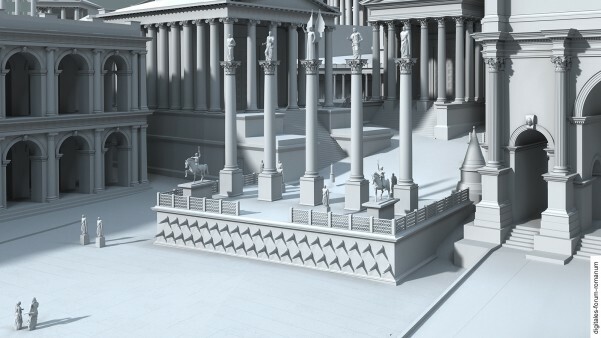 The appearance of the new Caesarian Rostra was based heavily on the visual appearance of the old Republican Rostra: Just like its Caesarian predecessor it had a curved form and an elevated platform on the side facing the Forum, with a curved set of steps at the back. 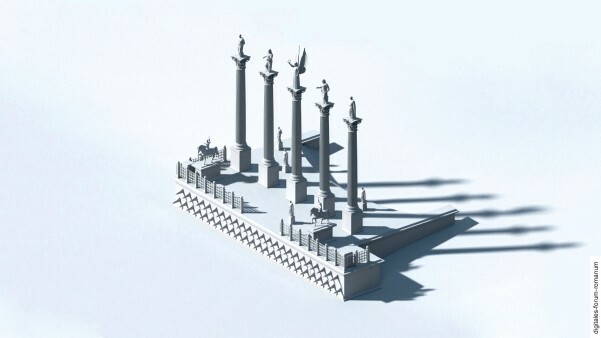 Caesar also had the old naval rams of Antium as well as important honorific statues, such as the equestrian statues of Sulla and Pompey (which had stood on the old Rostra), re-erected on the new speaker’s platform, supplemented by his own statues. 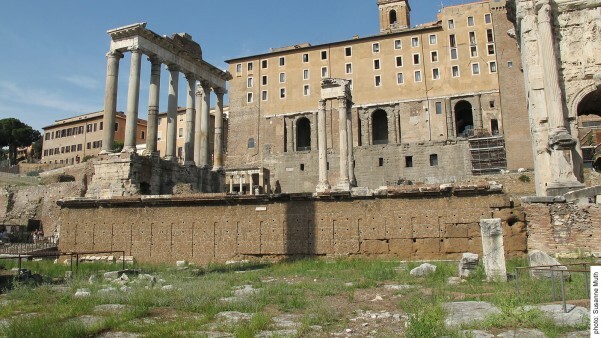 He left it to his close companion Marc Antony, whose name was also mentioned on the foundation inscription, to dedicate the platform at the beginning of the year 44 B.C. Only a few decades later the curved platform was to undergo significant changes: A rectangular platform was placed at the front so that the Rostra now ended in a straight line. The old naval rams of the fleet at Antium were affixed onto the new outer wall; the Caesarian Rostra with its curved set of steps served primarily as a way up onto the back side. These changes constituted a new appearance of the Rostra that it would retain for the following centuries. 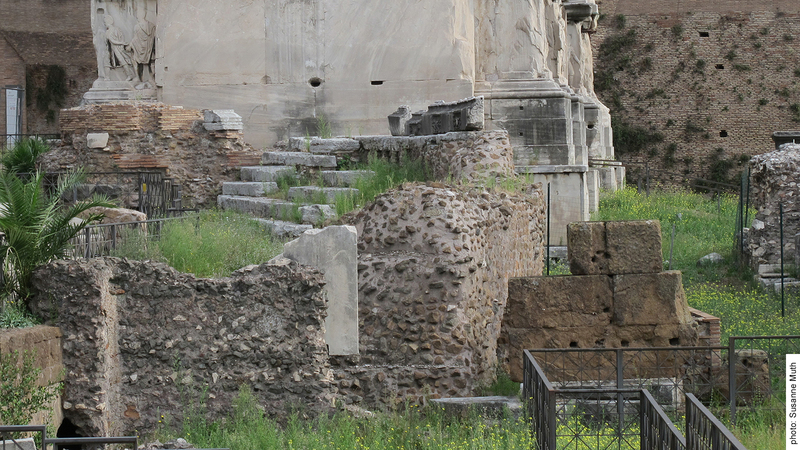 These alterations were initiated by Caesar’s political successor, Augustus, which also led to the speaker’s platform acquiring a new name (“Rostra Augusti”). The exact date of the dedication of the new speaker’s platform is unknown. Most likely, the dedication occurred within the context of the dedication of other significant structures of Augustus on the Forum in 29 B.C. (the Curia, the Temple of Caesar). After the public strife between Augustus and Marc Anthony in 32 B.C., which resulted in Marc Antony being declared an enemy of the state, and Marc Antony’s subsequent defeat in the naval battle at Actium in 31 B.C., it was no longer acceptable that a speaker’s platform built by Marc Antony was still standing on the Forum. Thus, it comes as no surprise that Augustus had a new platform erected with the aim of erasing his opponent’s from Rome’s memory. The new rectangular form of the platform also enabled Augustus to ideologically link the Rostra Augusti on the west side with a second speaker’s platform which he had also financed and built at the Temple of Caesar on the east side of the Forum square. 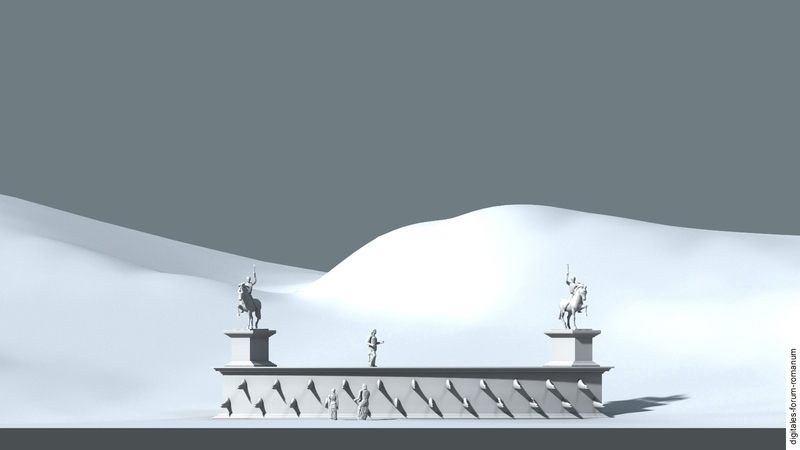 The similarities in the decoration of both platforms, such as the display of naval rams (the Rostra Augusti showcased the old Republican rams from Antium, the Rostra at the Temple of Caesar displayed the rams from the recent naval battle at Actium), challenged the viewer to compare both platforms and placed Augustus’ victory at Actium on the same level as other outstanding victories in Roman history. This mutual relationship between the two monuments was illustrated when the funeral speeches in honour of Augustus’ death in 14 A.D. were held both on the Rostra at the Temple of Caesar (by his successor, the Emperor Tiberius) and the Rostra Augusti (by Tiberius’ son, Drusus). Structural Alterations During the Flavian Period and the 2nd century A.D. Even if the general Augustan appearance of the Rostra Augusti remained untouched in subsequent centuries, this does not mean that no specific alterations were made to the structure. 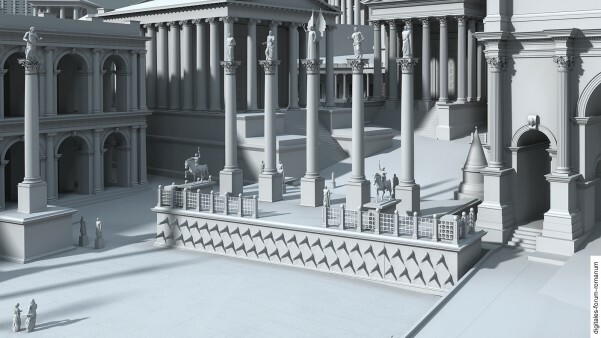 Analogous to the old Republican Rostra, the Augustan speaker’s platform formed the ideal place for public self-representation; erecting one’s own honorary statue on or next to it was seen as an especially prestigious affair. At the beginning it was only the statues of the Emperors and their families which were newly erected here; since the reign of Nero it was also possible for individual citizens to have their statue erected here and this was taken to be a special form of public honour. Thus, the weight on the platform increased, especially when one considers that the old statues from the predecessor platform had also been re-erected here. This development explains several of the alterations made to the substructure of the Rostra, which were supposed to ensure the stability of the platform (which was partially composed of wood). Especially the Flavian period saw a number of more extensive alterations intended to stabilise the substructure. The dating of the building material of the substructure further confirms this. 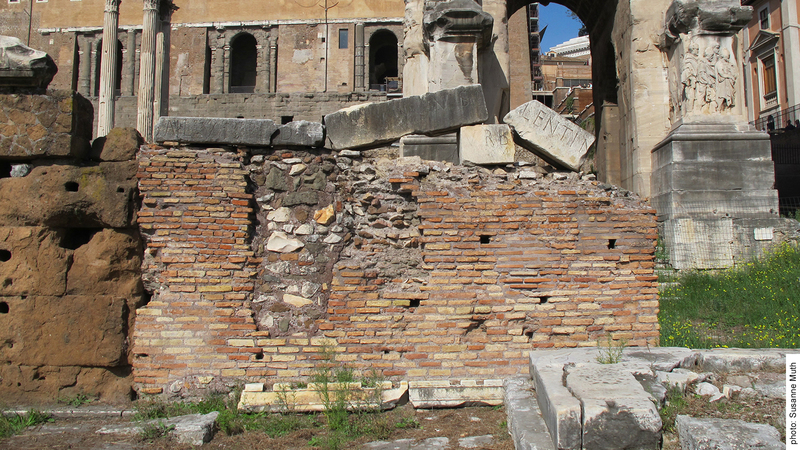 During the Severan period more significant changes were made to the structural substance of the speaker’s platform, probably in the context of the erection of the Arch of Septimius Severus north of the Rostra. Traces of a deep foundation indicate that a massive monument spanning the platform’s entire length was erected on top of the platform at that time. Further evidence supports the view that it represents a predecessor structure of the so-called five-column monument known for sure to have existed in the tetrarchic period. 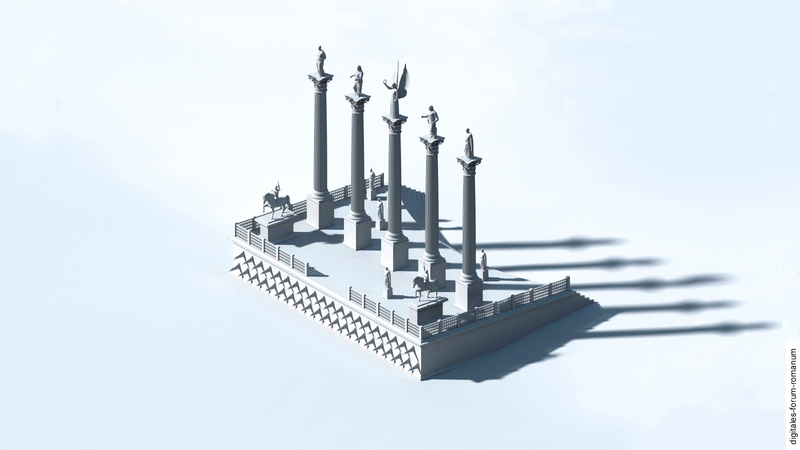 It was a monument for Imperial self-representation composed of five towering columns with statues situated on top and it stood on the platform of the Rostra. The monument’s appearance during the Tetrarchy can be reconstructed from a relief on the Arch of Constantine, which shows the Emperor Constantine addressing the people from the Rostra Augusti. 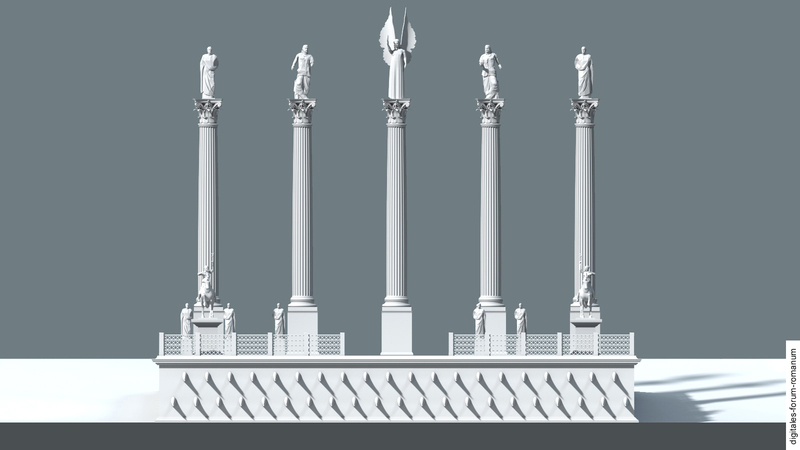 It has been demonstrated that the statues decorating the monument (within the relief) are the statue of Jupiter in the middle and the statues of the four genii of the Tetrarchs (this has not yet been incorporated into our model). 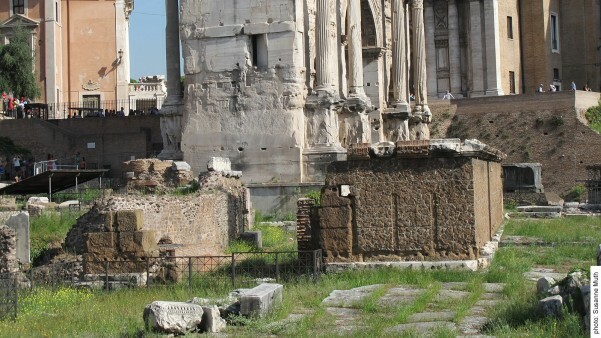 How impressive the Rostra with its newly erected columns must have appeared becomes evident when one considers that this form of decoration was also used for a second speaker’s platform (so-called “Rostra Diocletiani”) which was also built during the Tetrarchy on the east side of the Forum square and served – analogous to the older platform at the Temple of Caesar – as the new counterpart to the Rostra on the west side of the square. 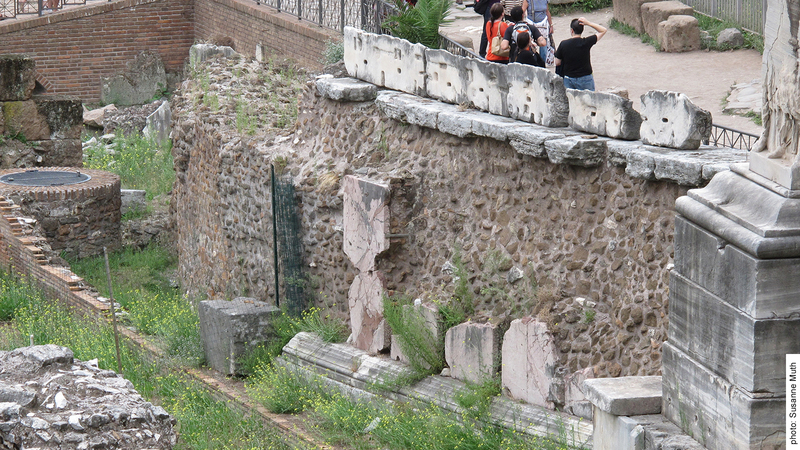 It remains unclear how the last alteration of the Rostra Augusti should be interpreted historically and chronologically: On the northern narrow side of the platform an annex was built which made the front of the platform longer. An inscription informs us that restoration procedures were carried out here in the second half of the 5th century A.D., which some scholars have linked to the naval victory over the Vandals in 470 A.D. This is why the annex is often referred to as the “Rostra Vandalica”. Other scholars have interpreted the annex differently. Based on an examination of the structural characteristics they have argued that the annex had already been built during the Tetrarchy, tying it directly to the erection of the monument with five columns. F. Coarelli, Il Foro Romano II. Periodo repubblicano e augusteo (Rome 1985) 237-255. A. Pulte, Rostra: “Fünfsäulenmonument”, in: E. M. Steinby (ed. ), Lexicon Topographicum Urbis Romae IV (Rome 1999) 218-219. P. Verduchi, Le tribune rostrate, in: A. M. Bietti Sestieri (ed. ), Roma. Archeologica nel centro. Convegno Rom 1983 (Rome 1985) 29-33 (31). P. Verduchi, rostra Augusti, in: E. M. Steinby (ed. ), Lexicon Topographicum Urbis Romae IV (Rome 1999) 214-217.